So far Jeff Miller has created 28 blog entries. 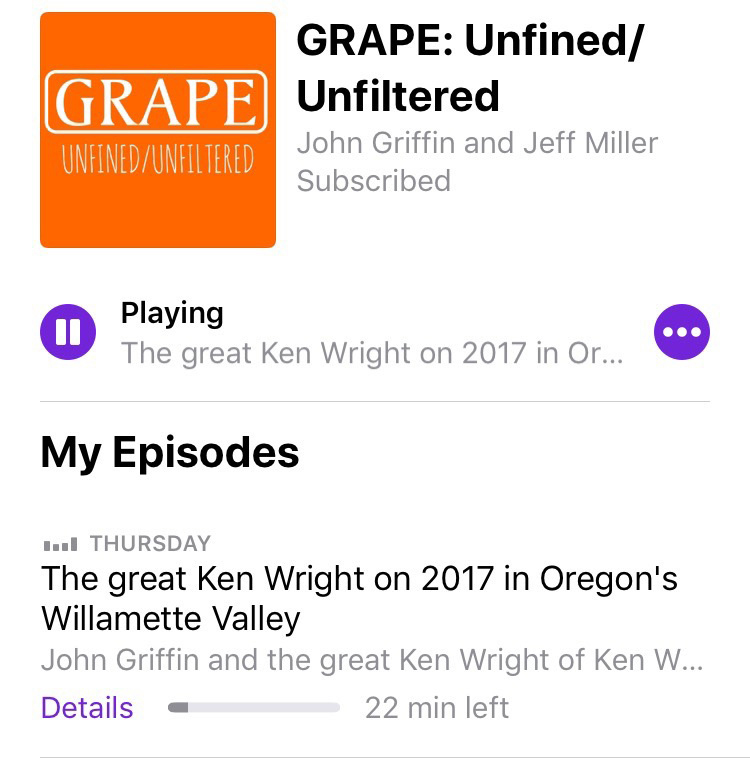 [John Griffin’s opening comments] Grape’s man in Portland, Angelo Simonetti, was heading out to Pichelemu to catch a little surf when he got the call. Derek and Pilar had just returned to their apartment in Santiago and said come on over and let’s try some wines. So he did. We join their conversation just as they’re opening a bottle of their increasingly popular Pais. Here we go. DEREK: This is what I had on hand, a half bottle. To me the 18 is interesting. It’s a little brighter. PILAR: Yes, less herbaceous than this one (referring to a bottle of they have open as well, I think it’s a 16). ANGELO: Okay. So if you have a full description on this, what do you think. PILAR: I think it’s still, it’s uhh, representative of the variety. We see that the wine notes like the herbal things, the smells, the aromas that you can feel, it still have a very nice body. I think at two years old the wines are still very well stand up. PILAR: Yeah, it’s holding very well. The tannins are impressive but it still has a smooth but you can feel them. It’s a light red. I mean it’s not cab. But it’s kind of, kind of serious Pais. A lot of people start to make Pais with carbonic maceration, being very fruity, very strawberry, cotton of candy aromas. I don’t like that style. I think it goes well with other dishes (?). It’s not, uhh, to show the variety in the end if you make carbonic maceration like you can use any variety, going to smell the same. DEREK: There’s a lot of Pipeño being sold in the US now, which to me is a different animal. A different thing. But I’m still pleasantly surprised how much Pais sells in the US. People just love the story and it’s just a lighter wine. It’s like buying Beaujolais or something. ANGELO: I can tell you it’s more than a Beaujolais. The quality would you get in the nose and the mouth… it’s not simple and one dimensional. PILAR: Yeah, but that’s what I was trying to explain with “a serious wine”. Like I mean the Pais it’s not just a simple, light wine. I think it has a structure, it has the tannins, a little complexity; it’s not just a simple wine. ANGELO: But it’s still have something, not just goes and pass. DEREK: The 15 is still drinking well. PILAR: Yes it’s sixteen, but 17 is sold. ANGELO: And holding that much? DEREK: The 15 holds. But I’m not sure how much longer. ANGELO: But you’re talking about Pais 2016, you’re talking about two years old Pais. PILAR: Yeah, and you have a year and half to sell the wine, so it’s been a decent time to sell the wine and for this variety. DEREK: The um, what we do with things with labels, these two wines we consider one winter wine. So when we began this project, when we were discovering where the old gentleman with their horses and plows had Cariñena. Normally when you did your roadside tastings, you tasted with them they’d have one foudre and they’d want a “luca extra” (1000 pesos) if you want to take a liter away, you’d have to take your own package, they didn’t actually have it bottled, and what their explanation was that that wine had a second winter and that justified the extra thousand pesos. 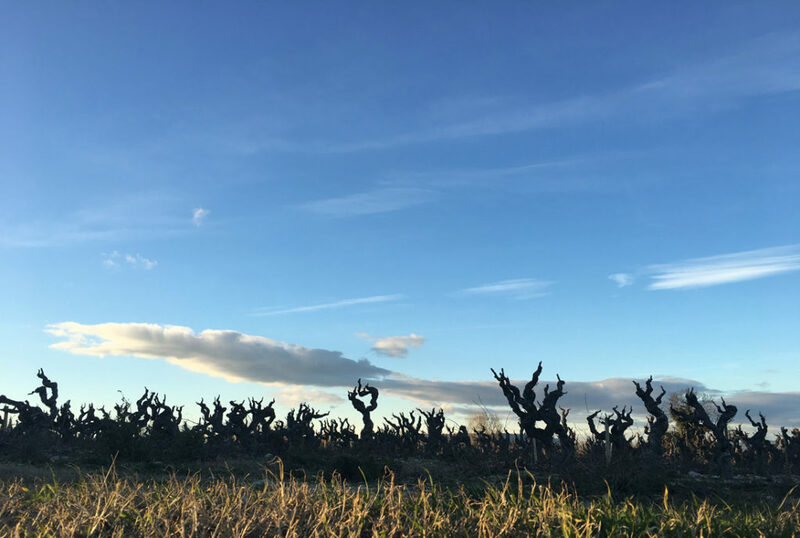 And that specially related to the second winter and in the end what we found is generally in the Cariñenas, the malolactic doesn’t finish before wintertime, so goes through its first winter without malo. It does it in the springtime and it really isn’t wine and unless you give it another winter of storage, it’s too racy. It’s too, it has too much acid. It seems that just that doesn’t come into its own. It takes longer to get over the hump. So what we did after working this concept of two winter wines for many years, we decided that, “you know what, we need, the farmers need to sell their Pais, not just their Cariñena, at a decent price. We need to make some things a little more approachable because it’s a cash flow thing. 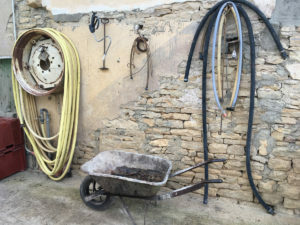 We want to sell some wines before two and a half years.” And in the end we began, the first one we made, was an old vine pale which is in Cariñena from a section of a farm that is, doesn’t matter what you do it has a higher, a higher yield and the old man won’t change, so let’s make a different wine, because we’ll want the good stuff of his down the road. So let’s do that one now. A one-winter wine. And you know in the beginning I thought was kind of, I suppose I was looking for something original to present, probably in Inglaterra, with the , in England, with the Bibendum people. There were just so many people in a room, presenting 12 months in new oak, and this and that and it was so clichéd and hackneyed all the phrases they used that I really loved standing there and saying how many months in a barrel was like one winter or two winters and they’d be like “what’s that?” and you’d have to explain it but then you had them in your hand because now then they’d heard enough of the story the old man and the plows that they wanted to hear the other bit. What was the other bits? Oh, people would say “How old’s the vineyard?” Well, they don’t really know. But they say that when they were young, the vineyard was old. It looked just like it did now and they’re now old, so it must be very old now. And they just kind of smile at you and realize. Ah, and then there were the percentages. They’d say “and what percentage of Mataró is in this?” I’d say I don’t know. It was 17 barrels of Carignan and one of Matarór. Have you got a phone there, you could probably calculate that if you wanted to. But to me we think in barrels and by the time the staff (not sure here) had a quick visit of the walk around tasting. They were into it. You were the only one they remembered from their loop, little walk around in the New World this afternoon. I thought it was absolutely brilliant. So we stuck with it. So in the past, some people kind of complained that it was too it was too difficult to learn the system of the lots and it was too complicated, there were too many wines. And it was like dude, I won’t dive into your business and tell you how to sell your wines if you don’t tell me how to make mine, sort of thing. So what we have done lately though is made sure that the online is everything. So if you go in here you see the parcels, we call them, all of these that we’re about to taste. So this is 73. So if I go to seventy three here (Derek is referring to their website), we have 17 with 73 16 was 63. I don’t know why 53 and 43 are here but you normally look back in the past further than that. So all of these, each lot, if it’s any kind of a franc it always ends in a two. There’s a system to it. Those numbers just kind of came out and we just stuck with them. So they weren’t logically organized. This was the seventy third one in gotten since 2000 and 3. DEREK: So a lot is a lot. A lot is a real lot. We’ve actually got some work to do for the new single-vineyard series. But all of these are here now and there’s an explanation of the parcels and everything is here so if you wanted to find the, what we were just laughing about the acidity of the sugar of 73, in theory the residual sugar is one point seven. In theory all of these things are here. ANGELO: Alcohol 12.6. The pH three point zero five. DEREK: That’s a low pH for this wine but most of the pHs are still pretty low. Most are unresolved sugars (I think that’s what he said) aren’t really a factor for us. That would be more or less average alcohol, this is kind of low at 12.5 A lot of these wines are 13.5. The idea is it doesn’t hit 14. You get that with the cabernets because that’s what the vineyards are used to doing. It will take time to bring it down a little bit if we wanted to, but all of these are here and there’s a root to all of the others (again referring to their website). ANGELO: Pilar how you describe this? PILAR: Ah this is very fresh. Absolutely. What we call, again, like a red. A chilled red. I mean absolutely. ANGELO: Can I sell this in the summer as a chill it up, patio wine? PILAR: Absolutely. It’s been very successful. ANGELO: I like this way. I like the temperature it is. PILAR: Yeah. It must be cold like a white. ANGELO: That’s what I’m saying. I like the way it is right now, but if it could chill out a little bit over there and serve it a party with my friends with a nice salmon. PILAR: Yeah, it’s very successful in UK. It goes really well with Thai food. ANGELO: Because there’s no sugar here. PILAR: Yeah. Maybe when many people start with the wines they say I don’t like the rosé. I say no, taste it. It’s not sweet. ANGELO: Yeah. There’s no sugar at all. PILAR: So that’s the idea. It’s a dry wine with a great acidity. So for, you serve cold or for summer salads. Seafood. ANGELO: Yeah. This is the, this is the salmon wine. In the Northwest we serve a lot of salmon at parties. ANGELO: It does. The acidity is balanced. There’s the tannins over there. ANGELO: It’s very light and refreshing. PILAR: We keep it in barrels for six months. ANGELO: Six months in a barrel. PILAR: Hoping it would round it out. ANGELO: Yeah, round it up in your mouth. Okay. This is a patio wine, for you know, well let’s put it in Celsius, when it’s 30 degrees outside. You don’t want to have nothing to do in the afternoon. ANGELO: Exactly. You want to just sit down over there. You can drink this. I can drink two bottles of this. It’s fine. DEREK: What we found is no one wants a patio wine that comes out in summer. This comes out October, normally. PILAR: By December it’s already in. DEREK: But it’s not doesn’t come out amongst the sales (could he be referring to holiday sales?). This is something we’d like to start moving more in the US. ANGELO: I think so too. I actually, this one of my recommendation right now cause my summer’s coming. ANGELO: And this, and this is, ya know, Is the cherry on the top the cake. DEREK: Yeah I think it’s really fun. Customers who have it do really well with it. What restaurants say they put this on the vino Matic machine, or whatever, on the thing. And they say you put that there and the people look at the different bottle and they right that, what they say to me traveling is that we’ve never had a wine that gives you the eats like that wine. And then they smile and say I am a restaurant, I sell food first so that’s a good thing. ANGELO: Yeah. This is by the glass. DEREK: And then what they say is that once they’ve had that by the glass people say, “What else do you have by these people?” you mean. And then you sell a bottle of whatever else. ANGELO: So just two problems for us. I cannot sell rosé in this bottle. A light red I can sell in the green bottle. If they go over then say it’s like red. You don’t call rosé we call light red. PILAR: Actually the label doesn’t say rosé, it says old vine pale. That’s right Angelo. That does sound awesome for the summer. A light red made from Carignan. Sign me up. Anyway, there you learned a little bit about Pais and how it came about and now the conversation continues with a discussion and a little slurping of some of the outstanding single-vineyard bottlings that garage produces. Take it away. DEREK: So the first one is Truquilemu. Well up on the Cordillera de la Costa. Granitic soils This is a little further down in the Sauzal, but it’s similar in soil and this one we’ll talk about afterwards because it’s further inland in kind of an odd way. This is pure, almost pure Cariñena with a single barrel of Monatrell, Mataró. This one has almost as much Garnacha as it does Cariñena with a little bit of Mataró again. And this is pure Garnacha. DEREK: … something like that. So the idea is that these are all different, but they’re kind of variations on a theme. I really liked what guy that writes for wine-searcher said…I really thought was interesting that someone wrote there. Well they did a mixed case from Chile. What you have to drink. And they go through the various wines, the famous, like the Montes Folly and bah, bah, bah, and he gets to us he say I’m not really going to chose one of these, any one from these guys will do. They’re all, how do you say, variations on a theme. They’re all wonderful and you just you just run through them and try them all, but I’m not going to choose one above the others. I thought that was kind of fun. ANGELO: The grip on this one is bigger than that one. PILAR: Sauzal. A very small town. DEREK: The herbs are different. PILAR: It shows very well today. DEREK: … while 65 are in the stride. in this dry. What can we say about these? These are all pretty, um. PILAR: I would like to say that if you taste the wines they are different. I mean they show the place where they come from. But you see a connection between the wines between the varieties that it has tannins, really ripe tannins. The have a grip, very balanced acidity. ANGELO: You can say, okay, this is a lot of acidity, but these two here with the very nice grip. PILAR: Yes. I think the Garnacha does. ANGELO: Yeah. And then just give, you see the, the impact of the wine. PILAR: Yeah. You need a dish of beef or something to eat with this wine. ANGELO: You know I, I, I like big wines in a reserve way, ya know. Initially, initially it’s just the…. because the complexity of this wine here and it’s still go round my mouth and just …(smack, smack, smack). I think sometimes the foods help but sometimes the food you need, just not too little time to understand better the wine. The wine is still talking to you before you have the next bite of the steak. PILAR: I like because you feel the dryness, but not, not in the tongue or your gum. PILAR: Here and in the front there, is come from the grapes not coming from the wood or tannins that you add. DEREK: To me this one a little bit bigger, but these are quite low. This is like, this is less than 13.5, both of these… alcohol. ANGELO: But you can see the…like the other ones. PILAR: It’s garnacha, I mean it’s really hard to make a Garnacha with 12.5. DEREK: What happens here is, this has literally pH of 3.3 and acid 6.15, it, it almost has numbers like a Cariñena. I mean sometimes it’s, uhhh…. DEREK: I really like this one. ANGELO: You see the evolution coming with the gripping and especially with tannins, the acidity. Wow. DEREK: This. Is my favorite today. The 65 wins. This is a little dopey. DEREK: Yeah. Well, this first one to me is just… in kind of dumb period. PILAR: Mmm, they have their…phase. DEREK: It’s got the nose. ANGELO: Because you put it side by side. No, but you put it side by side. You put a side by side. They’re different character, they’re different. DEREK: But most days this one goes straight to people’s heart. Just like a sultry tango it just the nails it and the herbs are slightly different. ANGELO: But you see these two here is a similarity. But this guy here is just a monster. ANGELO: [Angelo talking over Derek] This is a monster. DEREK: …this is further inland but what happens here… it’s a very interesting vineyard. It’s next to a river, but the river flows down from the Cordillera de la Costa. So it’s like an alluvial river bank vineyard, but the silt or the soils and it’s the make of the soils is granitic, so you don’t have those same round stones and it changes as the acid profile changes many things in the wine. It’s kind of a fun one because in the end you often speak about in this area it’s the river that flows backwards. It flows towards the Andes and then it finds its way to another river combines and flows back out to the ocean. ANGELO: This is lot of wine. The third one is just…a lot of wine. 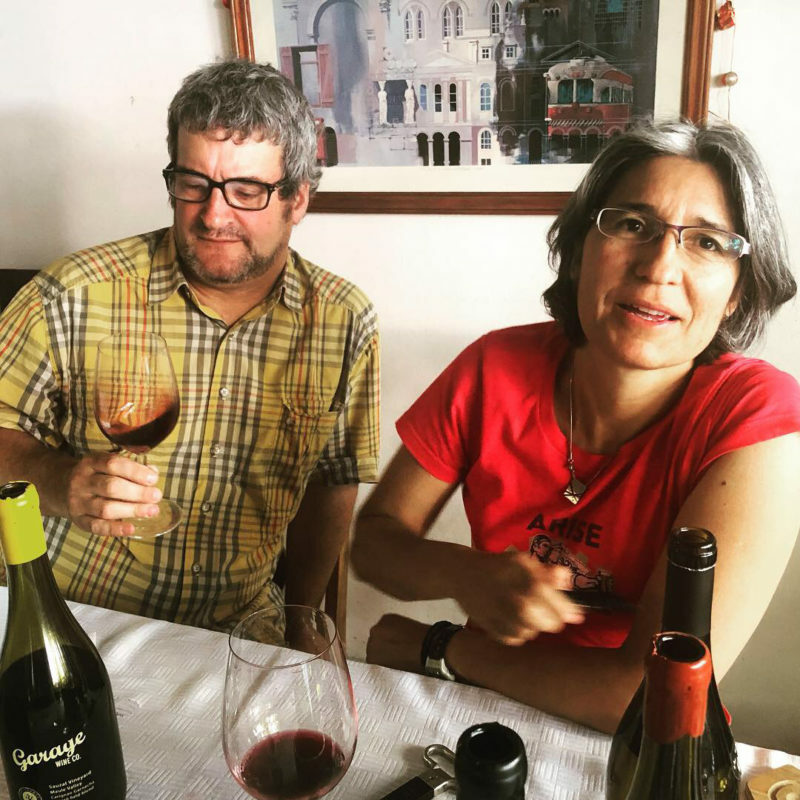 DEREK: Garnacha is still kind of making its way the, uh… in Chile you wouldn’t really think of Garnacha. There’s a couple. But they’re not really well known, they’re all tiny productions like this, and they’re all very different. There’s someone doing something interesting in the north. ANGELO: [Angelo exhales] Pilar, this definitely is a steak wine. PILAR: It’s my dad’s favorite. DEREK: This and the next year is the one that did really well with Luis Gutierrez is here and it was kind of a fun one because this is the year we start using a lot of reintroducing the lignified stems. We did a little bit in 15 and then a lot and 16 and the tannins just changed, they’re just different. ANGELO: Whew. The 69. OH. Delicious. DEREK: This is a property that we would manage more than just for us. We actually sell some of the fruit. DEREK: This Franc is a hundred and ten years old. It’s been quite an adventure to take it on properly. We used to buy kilos from it and now we manage it and it’s a lot more work, but we can get the alcohol to come down, we can get a little more of the herbally nature, but it’s still pretty, pretty big in this year. ANGELO: Which one is this? This is the Cab Sauv. OK.
Cab Franc you know, have his way back in people’s palates in America. ANGELO: By the way, this Cab Franc is having a totally different character from me. But they have a good tannins around the mouth. PILAR: It’s more rosés, more fruit. ANGELO: But you have a black tea in this. DEREK: To me it’s like a bit of a bay leaf which would be Cab Franc. See, and both of these are from the Maule. We make a cab and the cab franc from the Maipo. But we don’t…what we don’t like to do as the clients like this one or the other one we like to just rotate through them and start delivering them when they’re more ready to drink. So if one’s a little harder a year or we sell through one faster we start in on the other one right away. It’s 17 that the alcohol on this comes down, right Pilar. I was really looking forward to tasting that with you this week, but you didn’t get a chance to come down there. ANGELO: The 74? No, this is 82. The 82 is? DEREK: The 82 is still 14, but this comes down to less than 13 the following year. I’m really interested in trying it. ANGELO: How about the74? How much alcohol is in the 74? It’s not here yet. I don’t know why 74 is not up yet. Who’s in charge of this. PILAR: I don’t know if they’re going to fire me. ANGELO: Fire him. Pilar, send him home. PILAR: If you really want to know, it’s on file. DEREK: It’s kind of funny cause when we started, as people who live in Chile, um, when we started making Cab from somewhere other than Maipo, it took us a while to get our heads around it and what we were surprised by was that the critics actually like the Maule ones better. But not the Chilean critics. Chileans have this thing with them. One of the write ups of, I can’t remember whom, they compared it to Tondonia, which to me was just. It’s kind of like, whoopie if someone says your wine’s like a Margaux. It’s kind of like, yeah right. But when they say something like Tondonia youre kind of like, wow, that’s cool. There were two that he compared them to this year. Ah, it was another one of the other blends of the Carignans he said it was like a Barolo Chianato. DEREK: Barolo Chianato. Have you had Barolo Chianato? DEREK: I was like, What the hell’s that? I had to look it up and then everyone is like, loves Barolo Chianato and I was like, oh nuts. DEREK: Instead of making a port or something like that. I think something that has, cause in the end it’s like a port but it’s it’s with medicinal, right? PILAR: Yeah, but that doesn’t really count. DEREK: And this is a very ugly label but it shows the point. DEREK: The reason that we can, how do you say, take chances. The reason we can take chances, it’s not that we take chances, but when we make these wines, when there is a barrel of 8 or a 15 or 21, depending on how big the lot is and there’s a barrel that talks too loud and once you put it in the blend there isn’t harmony anymore, it’s the one that you notice it too much. We put those away for a third or fourth winter and we make a solera that is perverso. So in the end you can, how do you say, make mistakes, but you end up using and regaining something. Unfortunately we’ve never been able to send this to the US because no one will you work with the name. ANGELO: I want to know if that’s true over there you advertising the label. “Fix bad relationship you failed”, then I wanted five of this right now . DEREK: We talked about doing this for the US. PPILAR: We’re going to change the name. ANGELO: I like it. But I like it perverso too. Evil. Evil. PILAR: Yeah, but there’s an issue with the name with the church to make sure. ANGELO: Ah, you have someone here. PILAR: No, no, no. I mean that they relate the name pervert. PILAR: So we’re going to change the name. ANGELO: I can see that much. Maldita? I like that too. Hmmm, Barolo Chianato in Chile. Oh that Derek. But the Maldita Solera sounds interesting. Hopefully we’ll see that in the US soon. And what’s up with Angelo loving the 69 and getting all giggly over the perverso. Hmmm, maybe he needs to get out a little more. Just kidding. Anyway there you go. Thanks again to Derek and Pilar of Garage Wine Company for taking the time. Our first day in the Loire brought us to a cloudy Touraine where we spent most of our day with the leadership team at Loire Propriétés, and checked in with Christophe Godet at Domaine de Marcé. Our tasting took place at Vignerons Oisly & Thesee, a cooperative holding 500 acres of mostly Sauvignon Blanc and Cabernet Franc in the small towns of Oisly and Thesee which usually are considered the best in the Touraine region. You know by now how we feel about cooperatives – That when managed strategically they can turn out plenty of individual, engaging wines. Loire Propriétés is one such cooperative, and actually what you’d call a “supercooperative” (ie a large parent cooperative made up multiple smaller cooperatives). 250 winegrower members, organized into 10 smaller cooperatives, make up the group, many of who are bottling estate grown wines, some from iconic Loire chateaux! Sound interesting? Estate grown wines at a cooperative? Yes! As we’ve said before there are some progressive co-ops out there these days urging you to rethink everything you think you know about the category. Very good tasting overall. great stuff at very competitive prices. We pulled the trigger on Chateau de Mauny, Chateau de Valmer, and Vignerons du Pallet (including the very fine bottle aged “Jubilation” Cuvee). Does the whole Vignerons du Pallet thing perk your ears? This is a fairly small, atypical coop of 10 members, all from Le Pallet in the heart of Muscadet. They have 250 acres and an average production of some 800.000 bottles. All 10 members have their own properties, they bottle and sell a part of their production themselves and another part goes to the coop for use in a larger appellation “blend.” The President is one of the owners and so is the winemaker. The facilities are at one member’s winery. 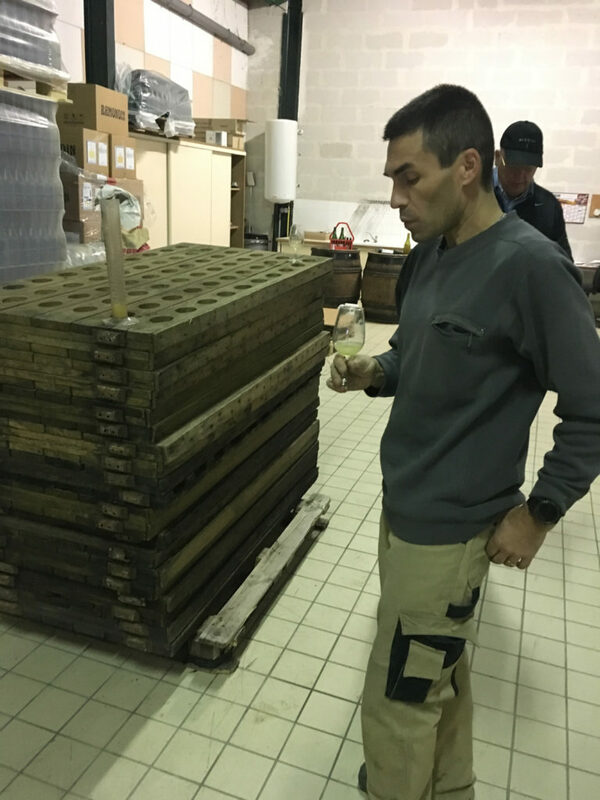 “Le Pallet” the vineyard is one of the Crus of Muscadet, there are seven crus in all, and is considered by many as the best. The soil is interesting, the northwest part of the town consists of light colored rocks (Roches Blanches) mixed with sand and the southwest area is dark colored (Roches Noires) and sand. Their “Jubilation” bottling referenced above represents a new movement in the appellation towards intense, bottle aged Muscadet with better selection, later harvesting, and longer aging on the lees. These wines are very different, more serious, fuller and real aging potential. For some stupid reason wines in this category cannot be called “sur lie” although they stay much longer on them. Odd. This Domaine is a few kilometers down the road from Les Vignerons Oisly & Thesee and the idea here is to bring you a premium Touraine Sauvignon option – Something a step up in price and complexity from O+T for the select few accounts smart enough to know how much value Christophe Godet can pack into a bottle. So many accounts are glass pouring “Vin de Loire” Sauvignon Blanc as a Sancerre alternative but this approach (something from an individualistic appellation) is a better way to go. In all this is an 80 acre estate, mostly planted to Touraine Sauvignon Blanc. A part of 12 acres has been classified as Oisly which is a new “Cru” similar to Reuilly, Quincy, or Sancerre. Farming at Domaine Marcé is organic, and most vines are pretty damn old. More tank tasting “reality television” for you below! As you see above we tasted many different tanks of 2018 Touraine and Oisly Sauvignon with Christophe and overall we were able to leave with a better feel for this unsung appellation. Domaine Marcé 18 Touraine Sauvignon Blanc, good body, ripeness, balanced acid, a lot of Sauvignon for the price. Domaine Marcé 18 Oisly Sauvignon Blanc, somewhat bigger and better but the price difference does not seem wholly justified this vintage. Great domaine, great people. Let’s try to get more Touraine Sauvignon out there in the world shall we? 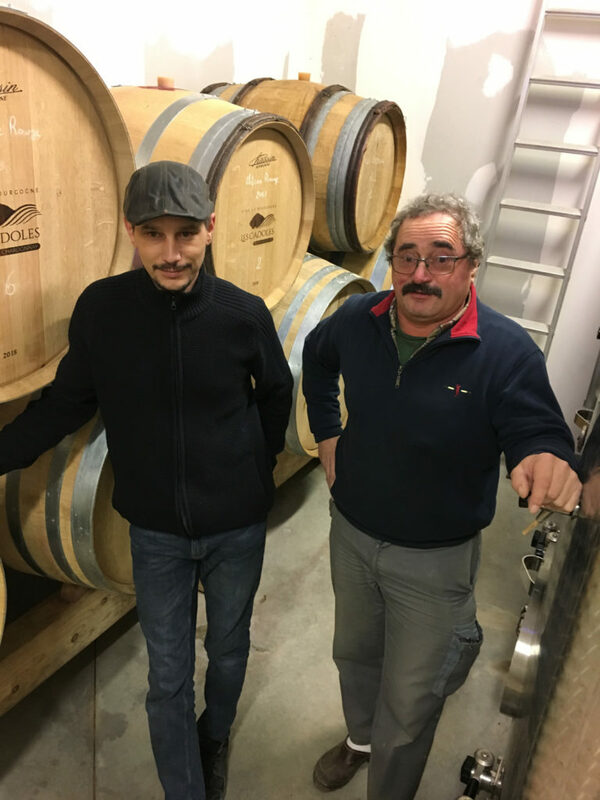 The brother/sister team of Laurent Fayolle and Céline Nodin operate this small family estate in Gervans, where they produce Crozes-Hermitage, Hermitage, and St. Peray. Crozes-Hermitage is a somewhat weird appellation – Originally it was close to the Hermitage hill, stretching to the North, covering a mere 750 acres in Crozes, Largange, Gervans and two other tiny villages where the soils are very similar to Hermitage. Over time the acreage was expanded by a whopping 3800 acres, but in another area, South of Tain- l’Hermitage, on totally different soils. The idea was that more production would make it easier to sell. This worked for the “new” production, but not really for the “old” as production is lower due to the (granite) soils and rather steep hills. This also explains a rather big difference in prices between the two. Fayolle is one of the very few “original gangsta” producers left, as they are focused on making wine from individual vineyards in the original appellation boundaries, most notably on sites known locally as Pontaix and the Clos des Cornirets. Almost all of Fayolle’s wine is sold within France. We will take what we can get. Domaine Fayolle Fils & Fille 2017 St. Peray, 100% Marsanne, some new wood. Fairly unknown, but lovely wine, dry, floral, lots of flavor. Domaine Fayolle Fils & Fille 2018 Crozes Hermitage Blanc “Pontaix,” (from barrel), bright, citrus, showing well. Domaine Fayolle Fils & Fille 2018 Hermitage Blanc (from barrel), rich bordering on bombastic but with focus somehow, interesting stuff, can’t wait to see this in bottle. 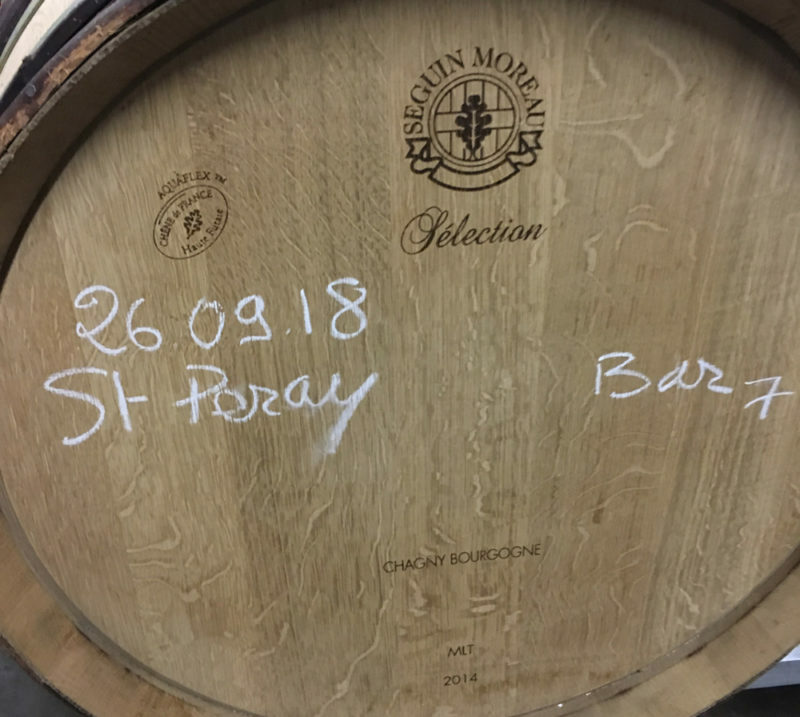 Domaine Fayolle Fils & Fille 2018 St. Peray Blanc (from barrel), Young, balanced, can’t wait to see this develop as well. Domaine Fayolle Fils & Fille 2017 Crozes Hermitage “Sens,” entry-level C-H, 30 year vines, including some purchased grapes, some new wood. Dark, fat, tannic, tight, very promising. Domaine Fayolle Fils & Fille 2016 Crozes Hermitage “Pontaix,” single vyd, 40 year vines, 20% new wood. More elegant, fine, balanced. Domaine Fayolle Fils & Fille 2017 Crozes Hermitage “Cornirets,” single vineyard, 60 year vines. Just bottled, but showing well, tons of fruit and full. Domaine Fayolle Fils & Fille 2017 Hermitage, just bottled. Big boy, fat, concentrated, tannic, smokey. 2017 and 2018 are both very good vintages. We also like 2016 but note that wines from this vintage are different in style from the others, a little lighter and more elegant. 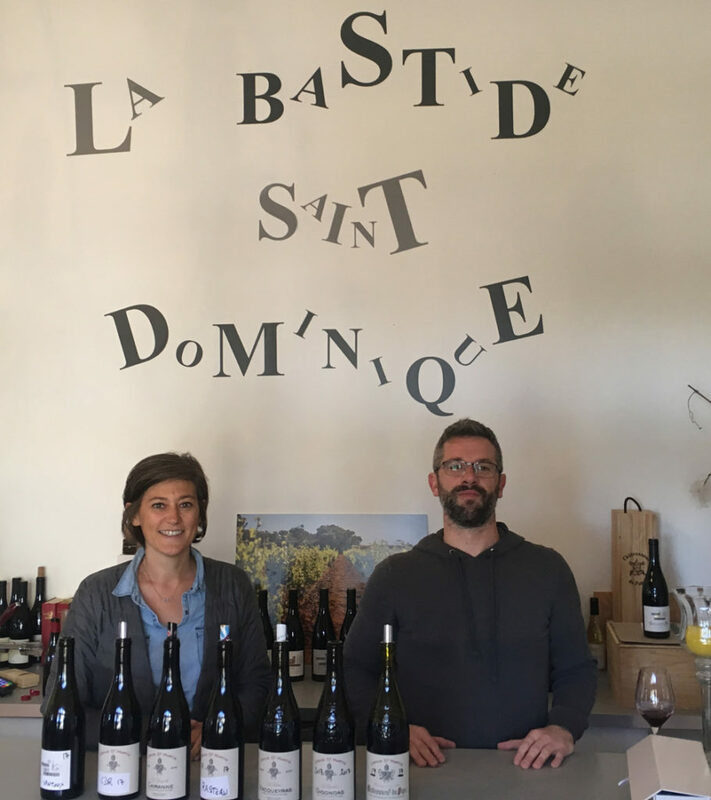 The brother/sister duo of Eric and Veronique Bonnet led us through a packed lineup of new and upcoming releases at their home base of Domaine La Bastide Saint Dominique. The property sits smack dab in one of the best sections of Chateauneuf-du-Pape – Even as little kids they knew they were in a prime zone for Grenache, if they ran outside to play and veered right they were at Beaucastel and if they veered left a few hundred meters they ended up at Clos du Caillou! There are three things you’ll see coming out of this property, Domaine La Bastide Saint Dominique, the production of which consists of wines made from grapes on the estate, Reserve Saint Dominique which is a second label made from younger vines and some purchased fruit, and Crous St. Martin which consists of both estate and purchased fruit and is a collaboration between Eric Bonnet and our good friend Harry Bosmans. We are ordering our first shipments of Domaine and Reserve St. Dominique this month, and you can expect more information on that front (with more background, tasting notes, etc) closer to arrival (the final lineup of available states is still coming together). Let’s just say that there will be some excitement. The lovely Eric and Veronique Bonnet! While availability is pretty tiny, Crous St. Martin’s Cotes du Rhone is worth a mention here – The grapes come from the same spot that Beaucastel makes their Coudoulet from, a zone in the northern part of Chateauneuf du Pape just outside the official appellation boundary, as there weren’t vines in this area when the appellation was originally classified. The Rasteau was just outstanding – Rasteau is the only appellation in the Rhone where grey clay and brown clay both coexist at the root level, this results in a forward wine with violet pastille aromatics that you must experience firsthand…with that in mind I suppose we will import as much as we can get! Crous St. Martin 17 Cotes du Rhone, full, rich solid. Crous St. Martin 17 Rasteau, concentrated, big, outstanding. Overall, very nice set of wines. Again, stay tuned for an announcement on the Domaine La Bastide St Dominique and Reserve St. Dominique wines. Madame Carichon led us through a quick lineup at this perennial, rustic favorite in Vacqueyras. Have a virtual tour of the property right here to get a better feel. Total holdings include 198 acres of vines spread between Vacqueyras, Cairanne, Ventoux, Gigondas, and Chateauneuf-du-Pape. Stylistically, winemaking veers towards the traditional spectrum here, where no wood is used other than in their Chateauneuf-du-Pape. Farming is natural. Domaine Brunely 18 Vacquyeras Blanc (tank), Musky, tropical, big. Domaine Notre Dame des Pallières 17 Sablet Blanc “Montmartel,” open knit, tremendous purity, wish Sablet Blanc was easier to sell! Domaine Notre Dame des Pallières 17 Gigondas “Les Mourres,” dark, big, fat, integrated, lots to like here! Domaine Notre Dame des Pallières 16 Gigondas “Bois de Mourres,” deep, tremendous concentration, still some obvious barrel flavors up front, we wonder what this would be like without the wood influence as the vine material is so good it is almost unheard of. 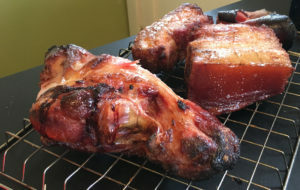 The highlights here, as usual, were the Cotes du Rhone, Sablet Rouge “L’Olivet,” the Cotes du Rhone, and the Gigondas “Les Mourres,” – All are naked examples of their kind and just screaming for the rustic bistro-like fare most of you enjoy making and devouring at home. …or you could make your life easy and just drink it with giant fatty chunks of smoked pork jowl and back fat! Veronique Maret led us through an energizing “breakfast” of new and upcoming releases. Veronique is young, serious in the best way, and stacked with ambition. 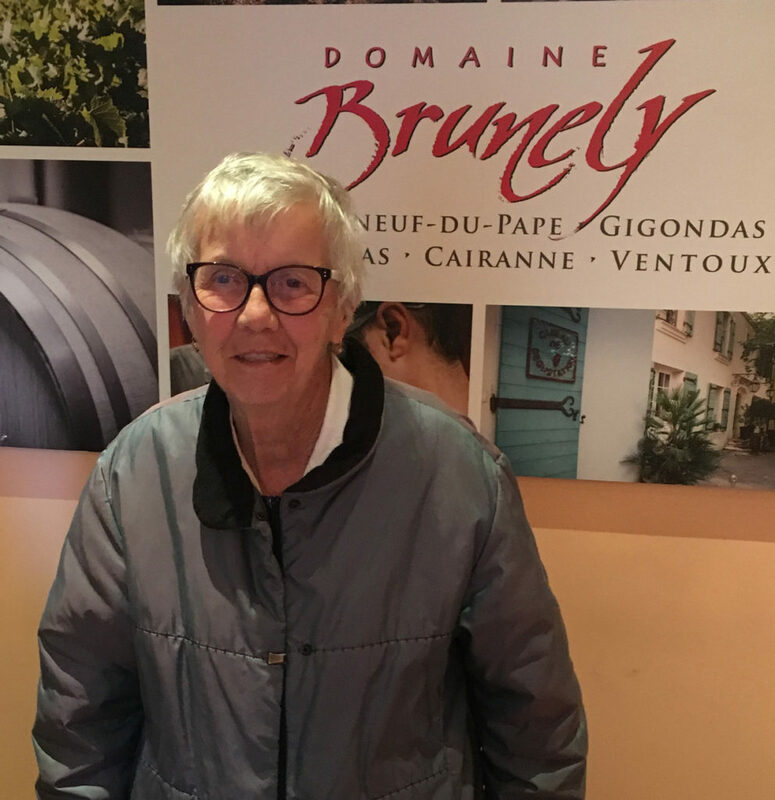 In her young but very capable hands this remains a traditional estate, and she has converted all of the Domaine’s farming to organic practices. The “entry level” CDP is outstanding, individual CdP cuvées are produced from the best blocks of the family’s best plots, and a sappy vielles Vignes blend is not to be missed in any vintage – in 15/16/17, as it contains a lot of Grenache from the La Crau vineyard in it, and as you likely know (unless you live under a bus) La Crau is one of the best individual plots in the entire appellation. We’ve had a stellar string of vintages here, let’s review them real quick as we have 2015 here and upcoming vintages allocated to us for shipment…The 2015 vintage is very good, typical warm year, the wines are a little closed now, should be better after a trip across the water. For us 2016 is better, more color, more elegant and a spicy character. The 2017’s are outstanding, dark, fat, polished and tons of fruit. This is mostly because of the small crop and the good growing season in CDP. age well, but we would be tempted to drink them young. We will buy as deep as Verionique’s allocations allow, and smart merchants and somms will do the same! Domaine le Clos des Lumières is a 50 hectare family farm founded in 1946 by the grandfather of the domaine’s current vigneron, Gérald Serrano. 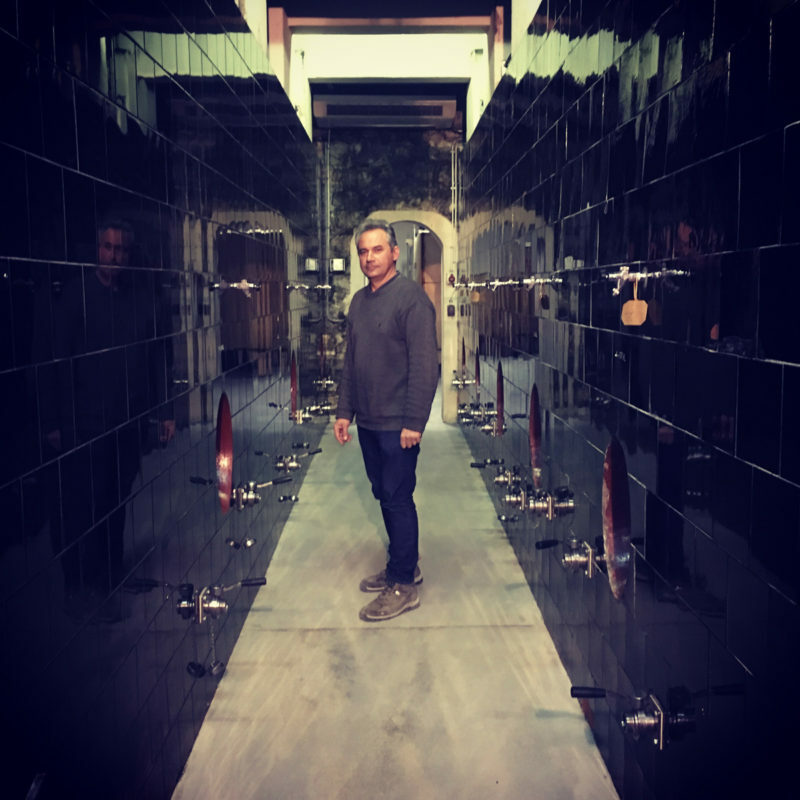 The ambitious and talented Gérald Serrano is solely responsible for the recent “coming out” of this estate – Prior to taking things over in 2003 Gérald’s father was selling all grapes on the estate to the local cooperative. We had fun shooting VR pics with them, here is a look on Google Maps – They were intent on holding the pose which was basically perfect. The kid on the right? He is the newest generation, just started on the tractor, and you’ll get to know him well. Having grown up on the property, Gérald is intimately familiar with the terroir here. The oldest vines now edge 60 years in age and this land really seems to “pack the character in.”. We’ve sold massive amounts of Rhone wine over the last forty years, and these are the most well-received Cotes du Rhone values we’ve carried in our history. These guys seem to have a deep understanding of what’s going on in the vineyard and in the market, they are probably the hardest working partners we have, and as Frank will tell you it is pretty amazing to see how forward thinking they are. The potential here is huge, we have only scratched the surface. When they heard what we were up to last Spring in terms of the national expansion and the whole idea of “expecting some grapeness,” the Serrano family went out and bought another 70 acres of vineyard land, bringing their total holdings to 300 acres owned, plus substantial long term contracts. Between our two companies we have two parties ready to bring it! Domaine Clos des Lumières 18 CDRV, the best. Among the new wines we committed to the Gris (everything available, working on the label this week), a starting load of half CDR bottles (filling your requests my friends), and we are working on new bag in box package because anyone who knows me well knows of my hatred for Papyrus font (and the new package is looking sick so get ready for some full delivery trucks and empty shelves). 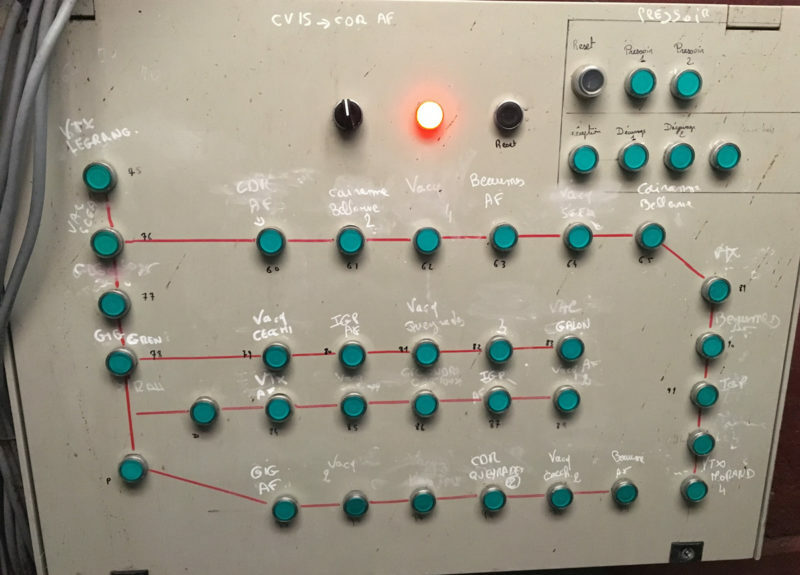 The no sulfur bottling of CDR showed well – We will test some in the elements here in the US, and if it fails to referment or go wild on us you’ll be seeing that as well. Mike Temple had a soft spot for Rhône wines and therefore the region has always been a strength in our portfolio. We spent several days both on our own and with the perennially charismatic Harry Bosmans. Vacqueyras’ oldest winery, Arnoux is centered smack dab in the middle of Vacqueyras center and takes up a few blocks with its various buildings. From modern operations to traditional ones to inexplicably idiosyncratic setups, we pride ourselves in our diversity of tastes! For better or worse! 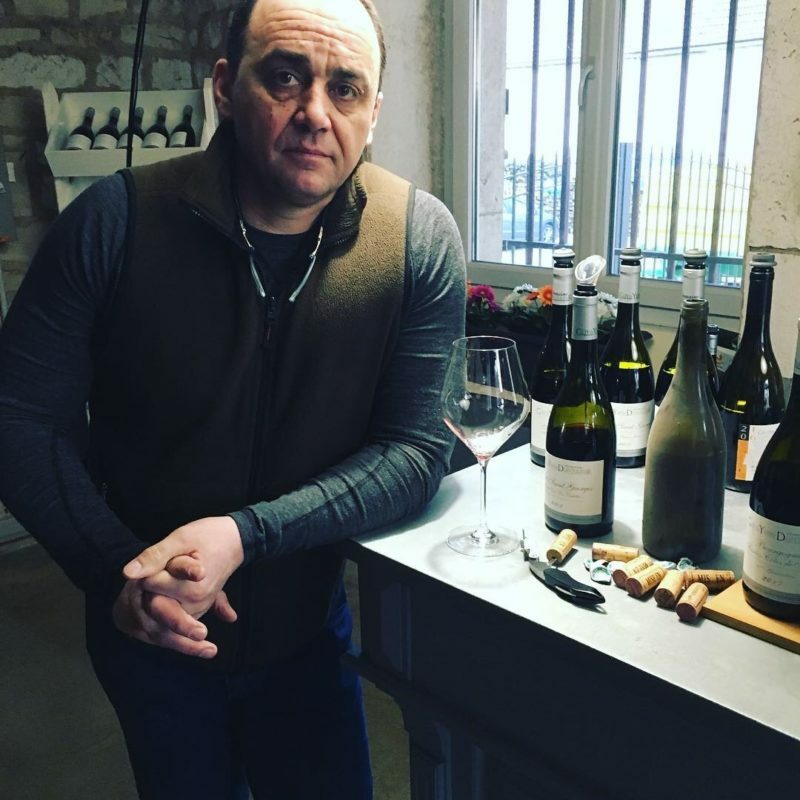 Jean-Francois Arnoux is the latest generation of his family to run the ship at this historic house, and take us through a Rhône lineup he did. Tasting notes are below but the short answer is that we’ve made the decision to double down on what Arnoux does best – the old school, and you’ll see more quantity and more focus on their Vieux Clocher line from us in 2019 and beyond. Below is a video walk through of what has to be one of the more timeless cellar setups in the Rhône Valley. I have to say this was one hell of an eye opening winery visit and it reminds me why we take these sleepless, jambon fueled journeys in the first place. We’ve long admired Pelaquie’s best in class examples of Laudun Rouge and Blanc, but never experienced their bombastic Cotes du Rhone values firsthand, at least not with an understanding of the simple but magic approach that results in a pure, focused, rich yet slippery core of Grenache goodness in every sip (sorry to tease, but more on Pelaquie’s proprietary technique later via video post to coincide with the arrival of the massive initial load of Cotes du Rhone Rouge and Rosè we booked on the spot…check back here in 45 days). Packaging was always a bit of an issue here but that was taken care of when we walked into the office and saw not one but three final draft options for a revised label that matches the spirit of this house. We decided on the below wardrobe, and the reference to Le Rive Droite (aka the underdog left bank of the Rhone) fits the whole spirit at Pelaquie like a glove. 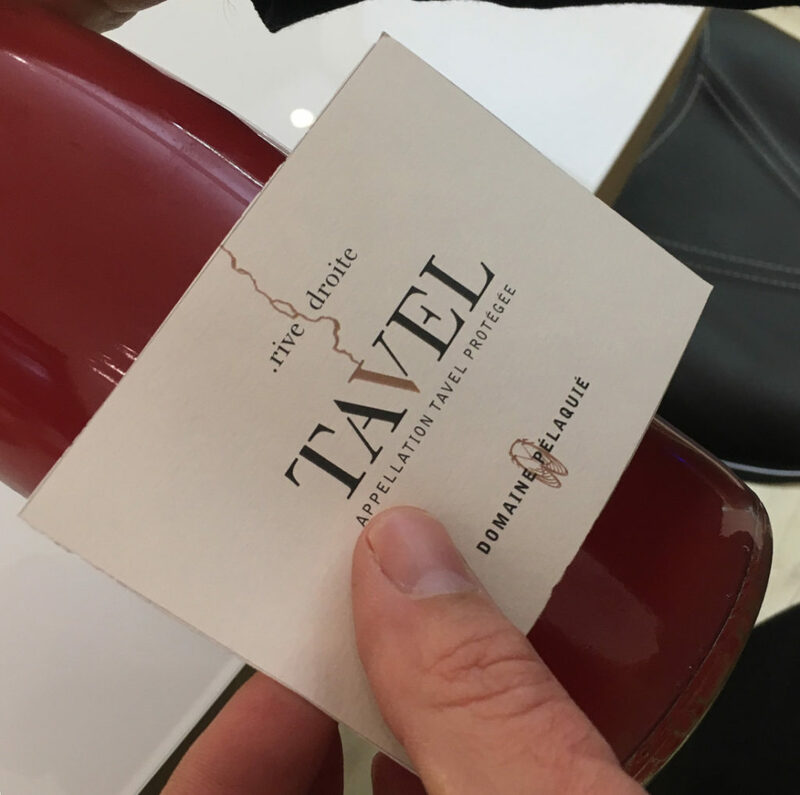 Frank will be the first to say that this is the finest Tavel in Tavel. All of you must agree if your appetite for it last year is any indication. 2017 was the warmest year in Lirac/Tavel/Laudun since 2003, but for some reason the whites have the highest acidity they’ve ever measured in the appellation…probably due to the 2-3 months with absolutely no rain which basically meant concentrated everything. Luc Pelaquie believes that in order to make balanced Rhone whites you need to use slow ripening varietals (ie Bourboulenc and Clairette). More than a few people will tell you that this little area here is the very best in the Rhone for expressive whites. We certainly feel that way right now. Mocking up the final label tweak on a deliciously unfiltered Tavel tank sample! Domaine Pelaquie 17 Lirac Rouge, MEATY! Only Grenache and Mourvedre used here, lack of Syrah gives this a specific personality. Lirac and Rasteau have the best Mourvedre in the Rhone, and if you add even 10% Syrah it totally changes the wine so as Luc would say, why add it. Lirac is planet Earth’s absolute temperature limit for Mourvedre. Another reason these are so good? Look at the thick old vines that surround the Domaine! Provence isn’t always sunny and warm – Temperatures were in the 40’s with a wicked mistral that made us feel like we were sitting in the stands of Soldier Field during a January playoff game. 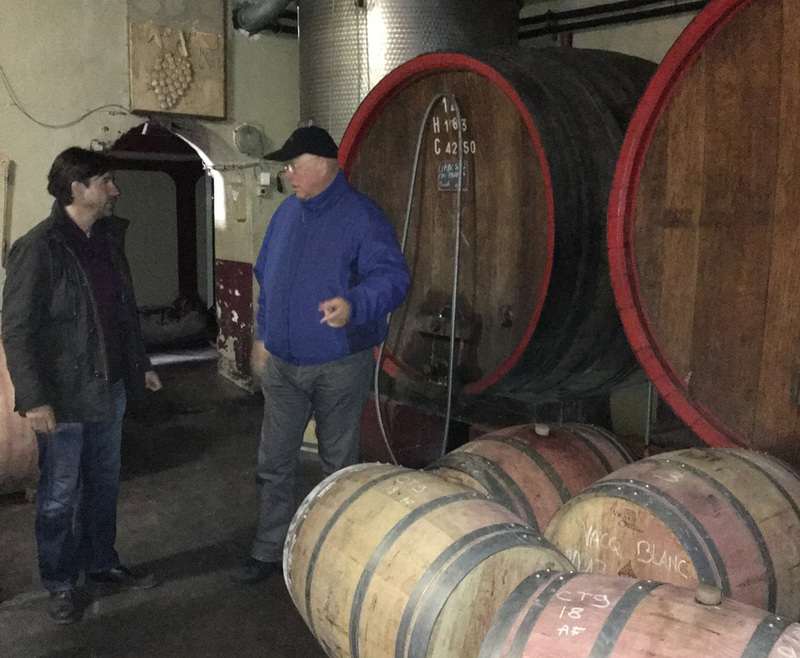 We had a bit more time today than normal and were able to spend quality time with two very important producers here at Grape, Domaine Sorin and Chateau Bas. 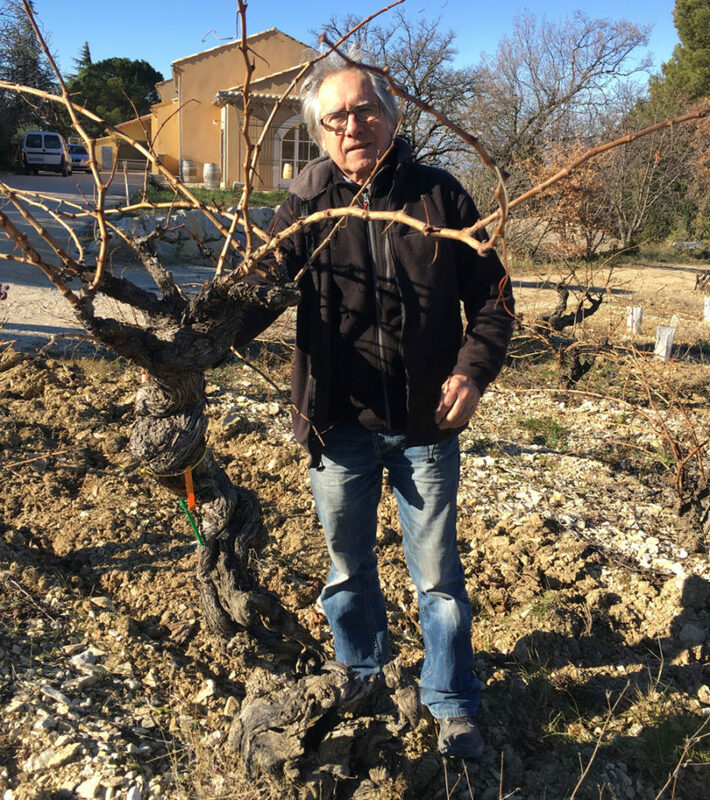 We met with Olivier Santini, who owns and operates the iconic Domaine Paternel in Cassis. 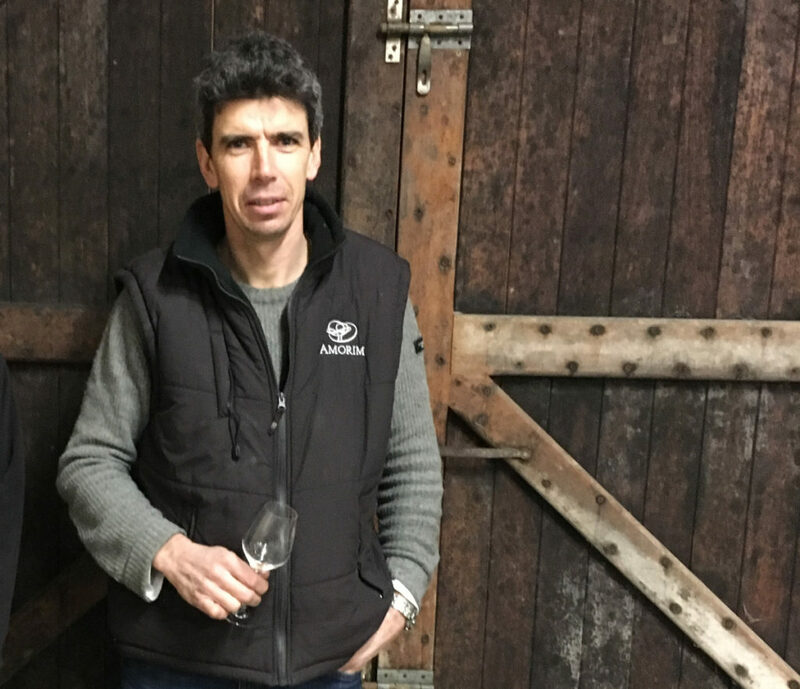 Olivier purchased Domaine Sorin several years ago after the untimely passing of Luc Sorin – This acquisition fulfilled his dream of vineyard property in Bandol and allowed him to feed the increasing demand for his Cotes de Provence Rose. The Cassis Blanc was an eye opener for me as I’d never been to Cassis or consumed the wines from this tiny AOP. Very little Cassis is exported as the demand is sky high in this gorgeous, touristed, seaside appellation. The pricing? As you’d expect pricing on AOP Cassis is extremely high. Frank will say way too high, I vote to offer some on a presell when the 2018 vintage is available as Olivier Santini will have a pallet or two available for allocation. I dare anyone to find a superior pairing with Bouillabaisse. Cotes de Provence Rosé also continues to climb in price due to insatiable global demand. We’ve worked hard to keep pricing reasonable for you on Sorin, not without some yelling and screaming at the winery, such was the episode between Frank and Olivier this evening as the sun set over this dreamlike property overlooking the Mediterranean. Our guess is that Cotes de Provence pricing has reached a peak and will stabilize (or even decrease a touch) by next year. 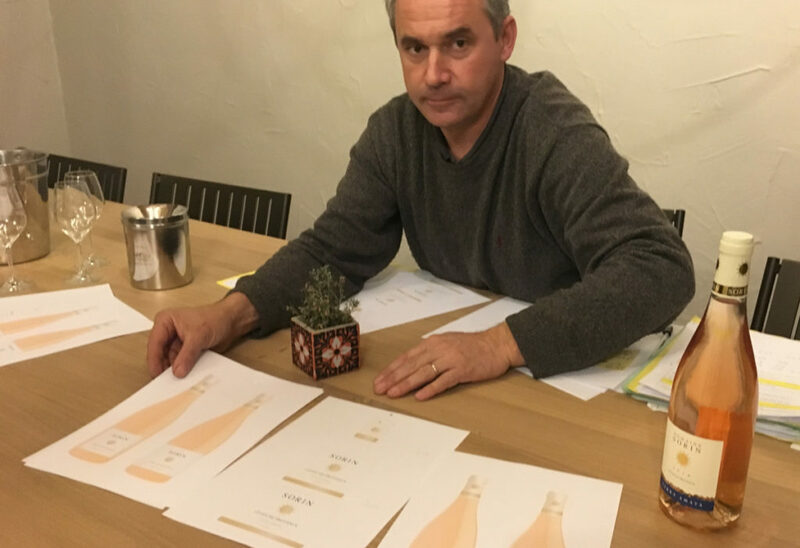 It is also worth noting that some time was spent tweaking the packaging on Sorin’s Cotes de Provence Rosé – The changes we made during our visit will debut not in this current vintage but rather with the release of the 2019 next winter. The property is owned by Mrs. von Blanquet, an older lady living in Baden-Baden, widow of the founder of Gaggenau kitchens. The estate is 170 acres in total, all organic, mostly planted with rosé destined red varietals (mostly Grenache and Cinsault), along with red destined red varietals (mostly Cabernet Sauvignon and Syrah), and whites including Clairette, Bourboulenc, Sauvignon Blanc, and Vermentino. 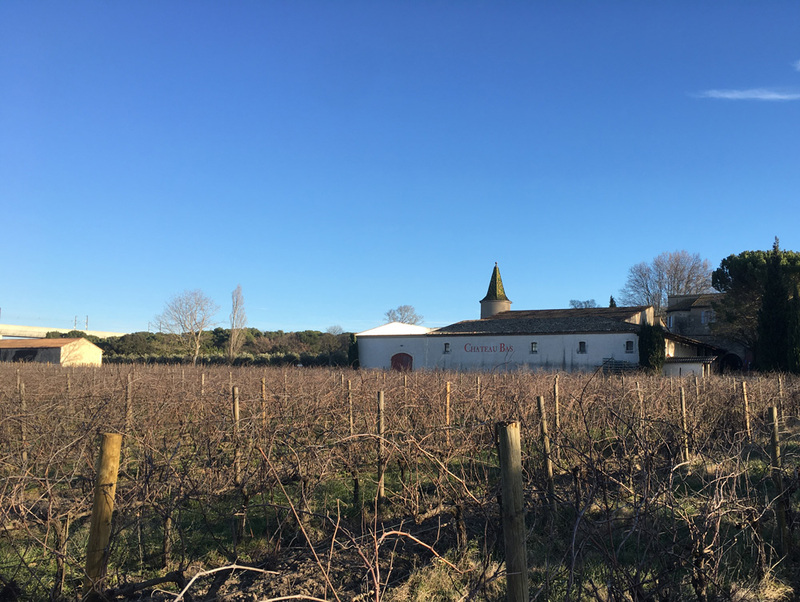 It is as historic a property as they come, all farming is organic, although the cellar is modern and efficient, where they produce 3 levels, Chateau Bas as we know it, the premium Pierres du Sud in 3 colours and the iconic Le Temple in red and white. The reds in the latter ranges are really good and so is the white Le Temple. All reds get decent “elevage” time, a minimum of two years in bottle prior to release. They all get more or less wood. The Coteaux d’Aix en Provence is a relatively small appellation, there are some 70 producers including 3 cooperatives. The region is traditionally a red wine producer, the rosé trend is led by economics rather than custom, but it turned out that the area produces some pretty good rosés which seem to have a little more body than the more elegant examples we see from the Eastern part of Provence. The whites at Chateau Bas are rather full bodied and fat and age well, they are considerably better than average in Provence. We should consider the Pierre de Sud at some point, with the more classic label and bottle. When you all are ready that is. Let us know. 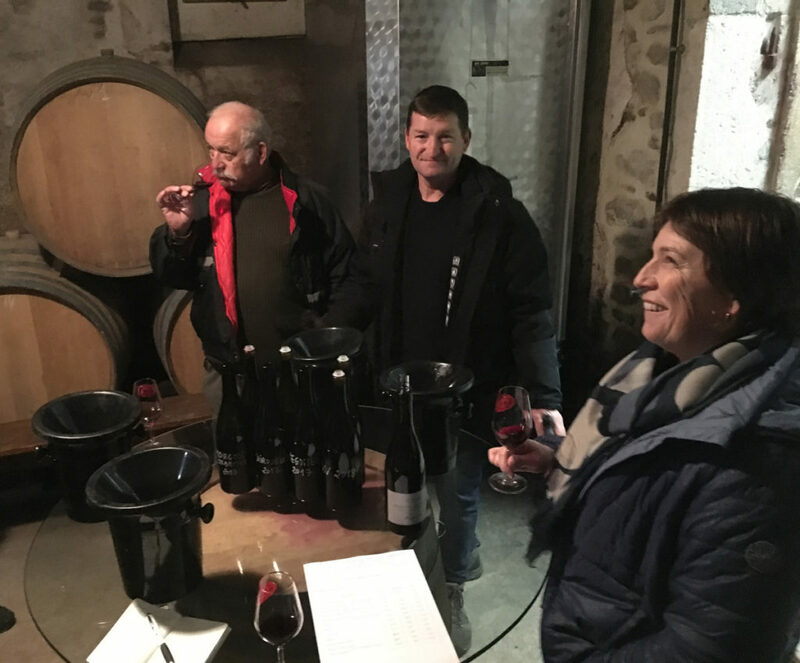 Frank Poot, John Griffin, and I are on a dizzying 12 day, 38 winery rout through France to taste 2018’s in barrel and catch up with producers. We are compiling our opinions, notes, and media as a group and posting them here for your enjoyment! 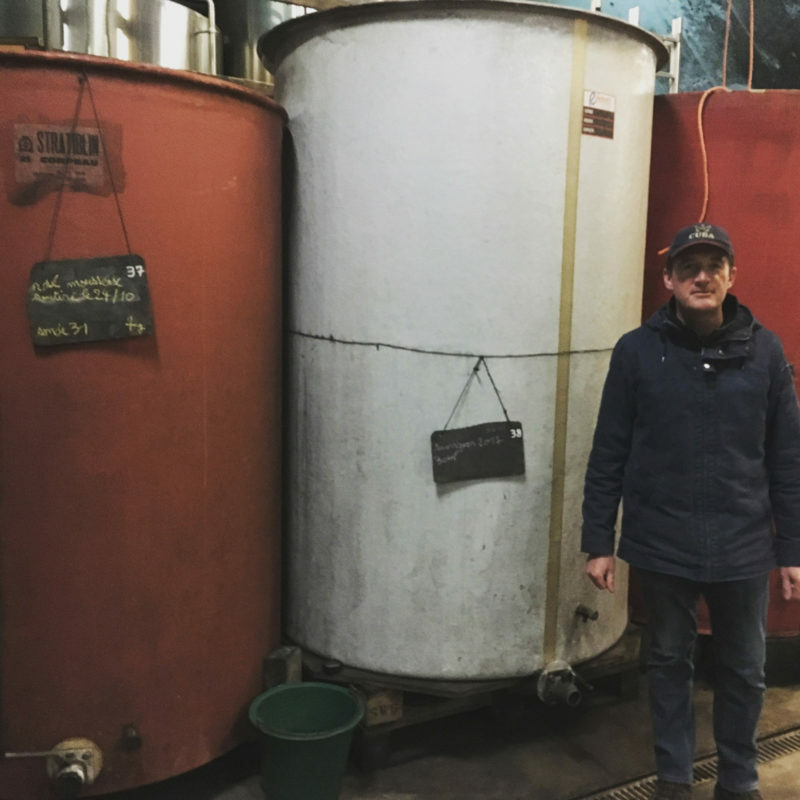 2018…Extraordinary vintage in Alsace. Large too very large volumes and very ripe at the same time. This despite a wet spring and a very dry, very hot summer. Harvest had to start early to retain acidity and freshness. The wines are unusually concentrated with high, sometimes even record alcohol levels. 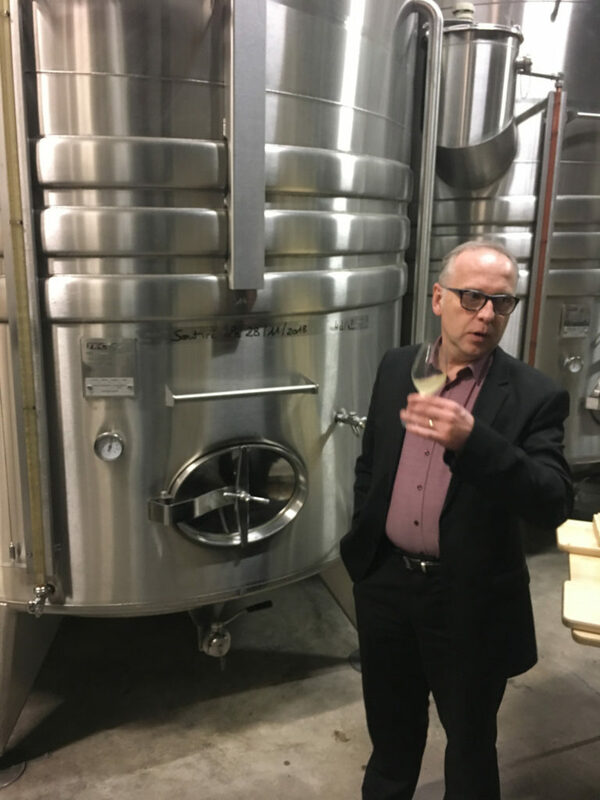 However, the concentration is such that this does not seem to be a big problem.Obviously, residual sugar levels in Pinot Gris and Gewürz are high, but the wines still seem to be balanced. Proprietor Xavier Engel runs what is probably the largest Biodynamic estate in France, and he is somewhat of an outsider on the natural/bio scene as he farms this way out of pure pragmatism (and obsession about mineral content in the finished wines) rather than being someone who farms this way for philosophical reasons. We will take it – Recent studies here showed 70% higher mineral content in wine from biodynamically farmed soil versus conventional soil (same area, same vine age)! 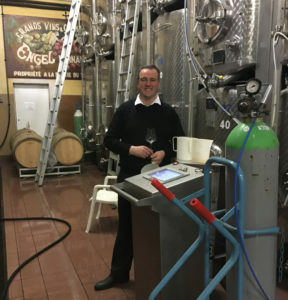 Xavier’s cellar is one huge science experiment and his newest passion is reductive winemaking – He is minimizing oxygen to the extreme in all vessels for what can only be described as unbelievable freshness and balance. We will dive into that on the podcast this Spring as it is a bit too technical to splice into this post. Domaine Fernand Engel 2018 Pinot Blanc, fresh, ripe, outstanding. Domaine Fernand Engel 2018 Riesling Rotenberg, big, intense, complex. Domaine Fernand Engel 2018 Riesling Praelatenberg, finer, more elegant, concentration. Domaine Fernand Engel 2018 Vendage Tardives (PG and Gewürz), beautiful, super-concentration, still good acidity. 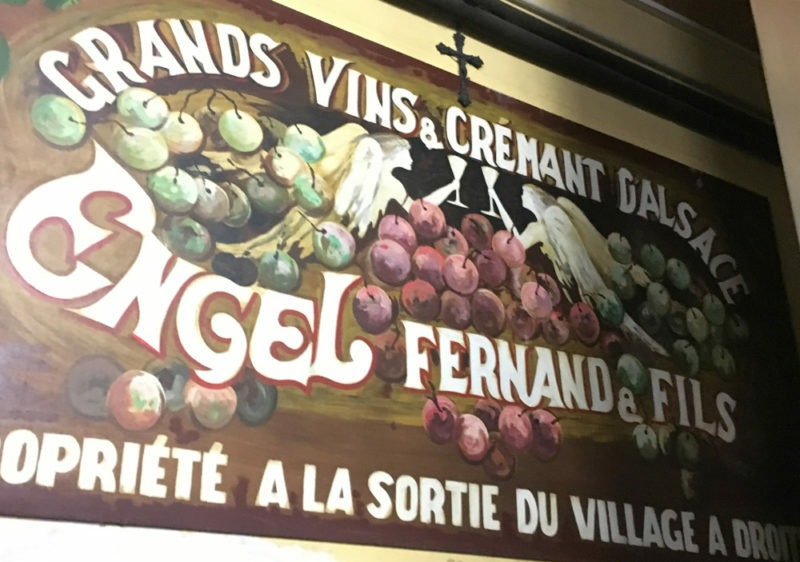 Domaine Fernand Engel 2018 Pinot Noir “Cuvee Engel,” very dark, full, tannic with good varietal character. Domaine Fernand Engel 2018 Pinot Noir “Meyerhof,” biner, more focused, despite young vines. Domaine Fernand Engel 2018 Pinot Noir “Reniassance” (with some dried grapes added), over-the-top, but if you like Amarone…. Domaine Fernand Engel 2016 Cremant d’Alsace Chardonnay, pale, fine, crisp. Very good indeed. The most interesting discovery on this trip was learning about Xavier’s unique process of making sparkling wines. We’ve long celebrated his bubbles for their rich mouthfeel and fine carbonation but weren’t aware that he was doing something completely unusual to accomplish this result. Intrigued? Listen to this short clip from Xavier on our podcast where he explains his philosophy of growing on “cool” soils in order to harvest at a high enough brix level to have the ability to achieve secondary fermentation with natural grape sugars. As you know there is quite the broad range at Cattin and we focused mostly on cuvees we carry since we are just in the process of launching things with them. Jacques Cattin feels lucky about the bountiful 2018 harvest. If you haven’t yet visited their spaceship like tasting room and wine bar you must go as there is nothing else like it in Alsace. Tactile wines. Cattin 2018 Pinot Blanc, aromatic, fresh. Cattin 2018 Rielsing Reserve, a step up, more acidity and a little smokey. Cattin 2018 Pinot Noir, dark, good character, fresh, some tannin. Apparently Cattin’s Demi-Sec “Ice” is a massive hit locally in Alsace. We couldn’t stop talking about it during our drive to Burgundy – We will give it a go on our next shipment, just in time for swimming pool season! The future ahead is very bright indeed for Cattin. Always looking for more ways to connect you with our winemakers, we’ve created the GRAPE: Unfined/Unfiltered podcast in order to give you some extra insight on the Grape Expectations wines in your sales bag, your retail shelves, or your wine list. As of today it is up on iTunes/Apple Podcasts and Spotify, so take a listen when you get in your car! Various members of our team here at Grape will act as rotating “hosts” and of course we expect to hear plenty of Rotterdam-based insight from Frank. Are there some specific producers you’d enjoy hearing as guests? Please let us know! Through the year 2016, Chateauneuf-du-Pape as an appellation was producing, on average, 120,000 hectoliters of AOC labeled wine per year. 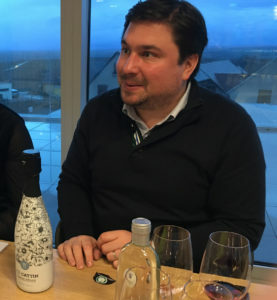 Earlier this year the firm Raphaël Michel, one of France’s largest bulk bottlers, was caught in a fraudulent scheme – The company had been passing off 20,000 hectoliters per year of basic level Côtes du Rhone as “Chateauneuf-du-Pape.” Raphaël Michel’s Chairman, Guillaume Ryckwaert, is now in prison, and for obvious reasons this scandal equals a 20% decrease in the appellation’s available labeled supply (yes, we now know 20% was fake, but very relevant as all of the supermarket chains who were gobbling up this “fake” Chateauneuf are still buying the same amount “authentic” Chateauneuf). 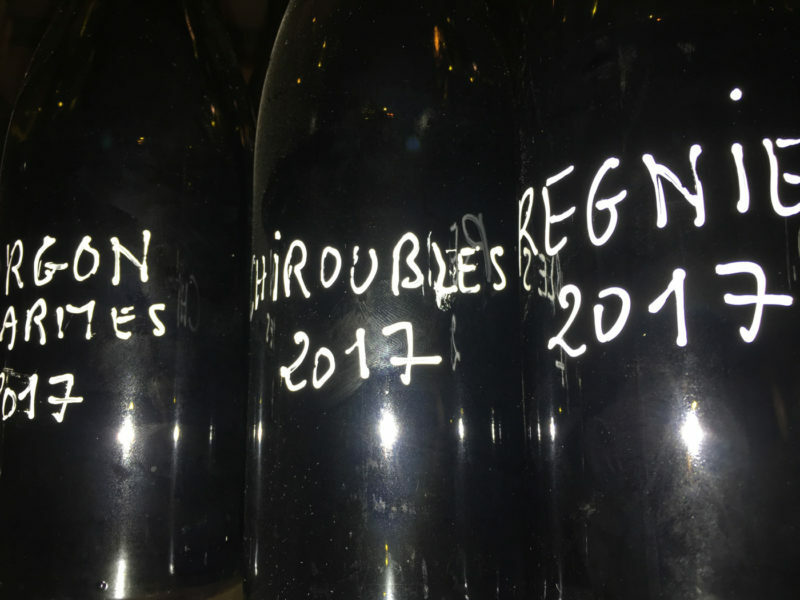 2017 was a difficult vintage in the appellation. Grenache is very sensitive to wet spring conditions, and buds had a difficult time converting into grapes. Harvest was down 30%,leaving total 2017 AOC Chateauneuf-du-Pape production at a meager 70,000 hectoliters. 2018 saw similar challenges, with mildew issues driving a 35% decrease in harvested material. 2018 AOC Chateauneuf-du-Pape production totaled just 65,000 hectoliters. The above three factors mean a 43% decrease in available AOC Chateauneuf-du-Pape bottled wine over the next two vintages! 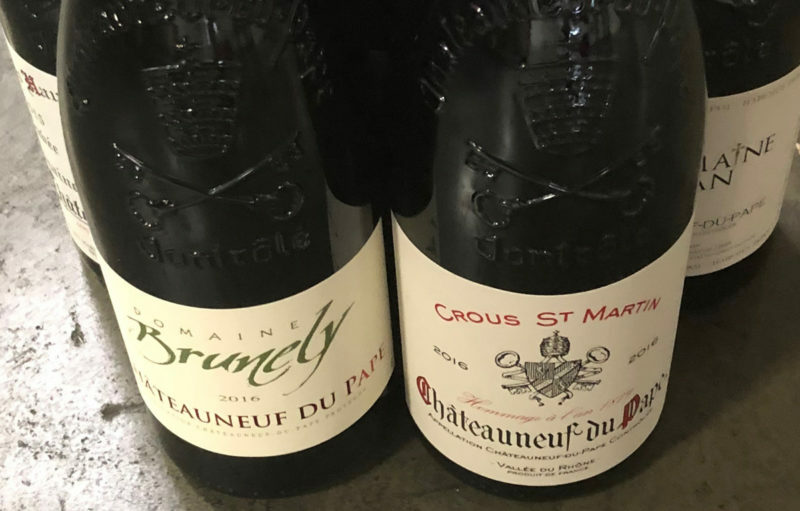 Whether you are buying from us or buying from someone else, if you see domaine bottled 2015 or 2016 Chateauneuf-du-Pape available on the wholesale market, do yourself a favor and load up while you can! Introducing the @grapexwine Spotify Channel! 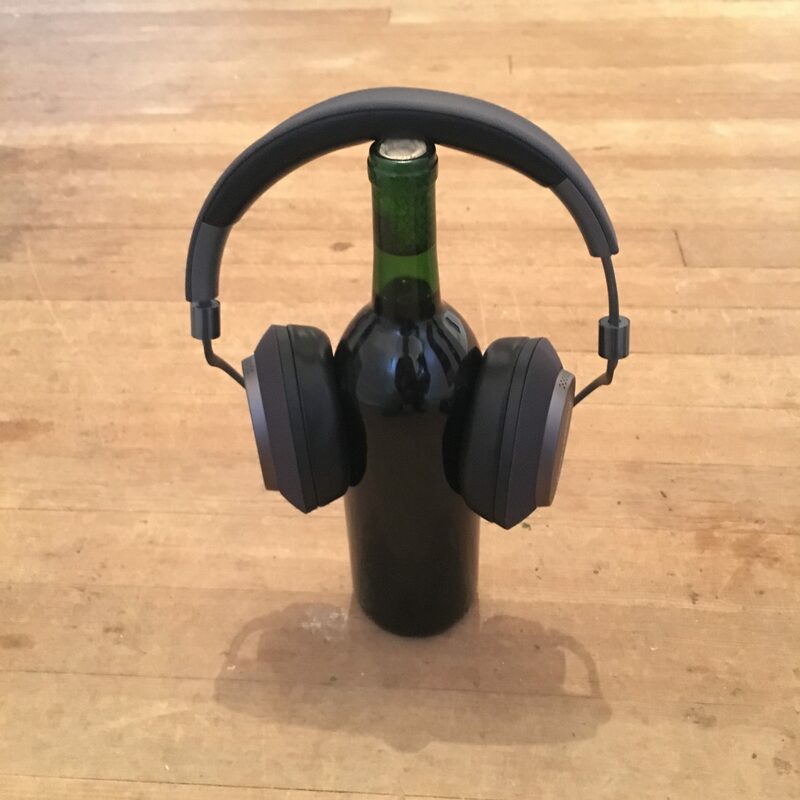 All of us in the wine business spend our fair share of time in cars and planes, so it just makes sense that all of us in this fantastic industry owe the world some sweet playlists, right? Musical tastes here @grapexwine run the full gamut, from buttrock (RIP Neil Lindblad), to punk, to Mariachi and everything in between. This Winter we are all about Scandi-pop (aka Scandinavian indie hits, with a shout out to our favorite Scandinavian winemaker, Steffan Jorgensen @ Elqui Wines), so click the link on the upper right corner of our grapex.com homepage (or just click here), grab your favorite cans, and enjoy!